Germany can cope with at least 500,000 asylum seekers a year for several years, Vice Chancellor Sigmar Gabriel has said. Germany expects more than 800,000 asylum-seekers in 2015 alone - four times the 2014 figure. Mr Gabriel reiterated that other EU states should share the burden. The UN's refugee agency, UNHCR, says a record 7,000 Syrian migrants arrived in Macedonia alone on Monday and 30,000 were on Greek islands. The migrants, mainly Syrians, are engaged in a long trek which takes them from Turkey, across the sea to Greece, through Macedonia and Serbia, and then to Hungary from where they aim to reach Austria and Germany. The migrant influx has unsettled European governments and prompted diverse responses. Hungary's conservative leadership is building a border fence to try to keep them out, but German politicians have expressed pride in crowds who welcomed new arrivals. A Greek minister said on Monday that the island of Lesbos, which sits off the Turkish coast, was "on the verge of an explosion" due to a build-up of 20,000 migrants. The government and UNHCR have brought in extra staff and ships to process them. What next for Germany's asylum seekers? What can the EU do to solve the crisis? Are you affected by the crisis? Despite the huge influx expected into Germany this year, Mr Gabriel said it was prepared for more in the longer term. "I believe we could certainly deal with something in the order of a half a million for several years," he said in an interview with Germany's public ZDF television. But he also urged other members of the EU to play their part. The EU is due to unveil proposals on Wednesday to distribute 160,000 refugees among member states on a mandatory basis. It is blazing hot at the Georgios Scufos Training Centre in Mytiline; a queue of hundreds stretches down the hill as Syrians wait for entry, covering their heads with clothing, bags, pieces of cardboard, anything to keep the boiling sun off their heads. Along one side of the former football pitch, plastic tables are staffed by Greek government officials, assisted by volunteer translators. The asylum seekers present their papers and passports - many have wrapped their passports so tightly in plastic that they struggle to get them open. But once they prove their identity the processing is quick. With government papers in their hands the migrants have what they so long for - the authorisation to buy tickets for the specially chartered boats that will take them to Athens. Nothing is easy for those arriving in Lesbos - but this hot little patch of land is the first piece of good news they have had for a long time. The UNHCR meanwhile highlighted the growing scale of the migrant issue, releasing new figures that suggest it expects 400,000 migrants to arrive in Europe by sea in 2015. The majority are Syrian, and the UN says many are now seeking a better life in Europe because of poor conditions in refugee camps in Jordan and Lebanon - caused in part because of a drastic shortfall in multilateral aid programmes. The UN's special representative for migration, Peter Sutherland, said several wealthy countries, such as the US and Gulf states, had in fact been generous in contributing financially to help improve the lives of Syrians in countries neighbouring Syria. But this was no substitute for taking migrants in. "Buying your way out of this is not satisfactory," he said. 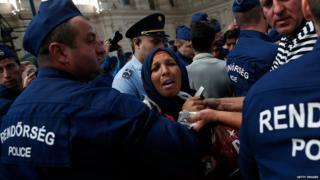 The crisis has divided the 28-nation European Union, especially the issue of obligatory quotas. Hungary, the Czech Republic, Poland, Slovakia and Romania, are opposed. Poland's President Andrzej Duda reiterated his country's position on Wednesday. "In Europe the talk is all the time about fighting the results, and little on how to liquidate the reasons. Europe is in a kind of a closed circle," he said. On the Greek island of Lesbos, a processing centre has been set up on an abandoned football ground to try to clear a backlog of stranded migrants. But correspondents described utterly squalid conditions there. On Monday, officials said that the processing centre on Lesbos would operate around the clock for five days to try to clear the backlog of migrants needing papers to move on. Are you in Germany? Are you affected by the issues raised in this story? Let us know about your experiences. Email haveyoursay@bbc.co.uk with your stories.